However, I’m not mad enough that I’d drop $1,200 for a dress that you can quite obviously only wear once or twice a season because it is just so outstandingly loud (it’s like when someone first told me that you can wear jeans two days in a row and I was puzzled because all my jeans were so embellished with glitter and paint and thread and rhinestones that it would be painfully obvious that I were trying to pull off unicorn emblazened jeans twice before Wednesday. Then I looked around and realized no one else bedazzled their Express jeans. Ah high school). 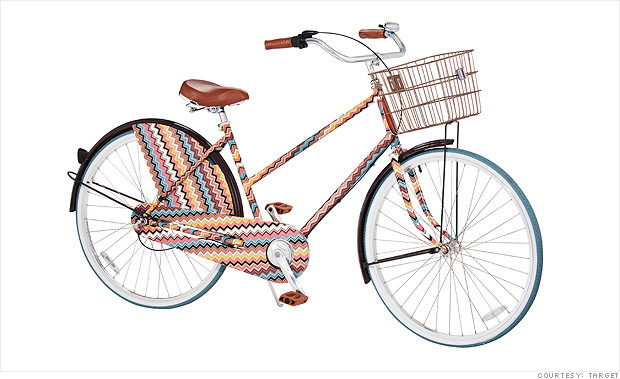 Anyway, the collaboration between Missoni and Target is epic. Sure, Issac’s done it (I have a pair of Mizrahi rainboots that I hope never die because they are fabulous, thank you.) and so have a dozen other Houses. Most of the time the designers invent something new, not evoking the flagship brand, or water down their look so much that even at Target you’re wondering why you are paying $20 bucks for a scarf that isn’t really special. Still, their success has been good enough for Target to continue the collaboration program, but it’s never been this popular. So popular in fact, that Target’s website crashed Tuesday, debut day, and had to create a sad Target puppy dog page which read: “suddenly, we are popular!”. Indeed. More to that point: The pop-up store in NYC, prepared to house double the merchandise you could find in any brick and mortar store, shut down in 6 hours, a far cry from the planned three days. On the Today show this morning a few ladies weighed in on the sell-out and website shut down, including the one with the most valid commentary, an actual representative from Target Corporate. She said that Target ordered the same quantity of merchandise – ranging from plates to notebooks to sweaters to a bicycle – that they had with previous designer collections, not expecting such a huge reaction. The flaw in logic there was that no previous collection was as expansive (a bike, people!) nor was any collection designed so closely attuned to the original works of art. Seriously, some of the zigzag patterning is dead on! Also, since mid-Summer 40 magazines have advertised the month long sale. The commercials appearing with increased frequency immediately before the launch were also stunning and exotic. I wanted to re-do my whole apartment after thirty seconds! You’d think with press like that, Target would be placing purchase orders frantically to avoid a stampede similar to that of Walmart’s Christmas 2008 fiasco. With so much going on this week and with little motivation to fight the crowds, I haven’t been to the store to check out the merchandise. I really do wonder though, how did the wares sell in Cleveland? I guess I’ll have to make the climb to the fifth floor of the parking garage in University Heights to find out. Or maybe I’ll just call. I’m sure the store associates would love that! Check out the collection, here. UPDATE! I just started playing around on the Target site and they’ve made it totally interactive in that you can watch the commercial, select the looks/objects you want to shop for by scene. Hover over the item, type in your zipcode and you’ll be presented with a list of stores that are most likely sold out! Sad. I tried to search the reversible throw seen in the scene when she answers the phone despite running late. Sold out in all of greater Cleveland. Oh well. Fun to play. anyway!